Manaslu Circuit Trek is wonderful unmatched Himalaya Nepali different cultures, famous trekking region along the Manaslu and Annapurna. Mt. Manaslu Larkye Pass 5163m Trekking is recently developed trekking trail and quite a busy one, where trekking group is given restricted area permit to enter into Manaslu region and compulsory with license holder trekking guide in restricted area Halesi Treks have experiences trekking and Manaslu is a magnificent circuit in Manaslu region. 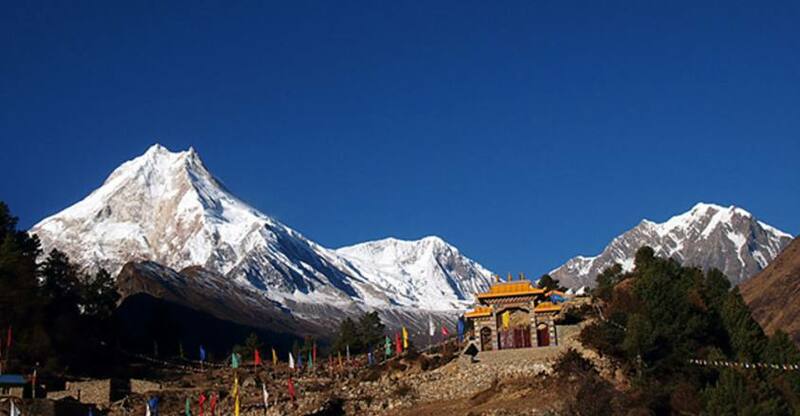 Manaslu circuit trekking can certainly be a great alternative trekking route to Annapurna circuit trek. 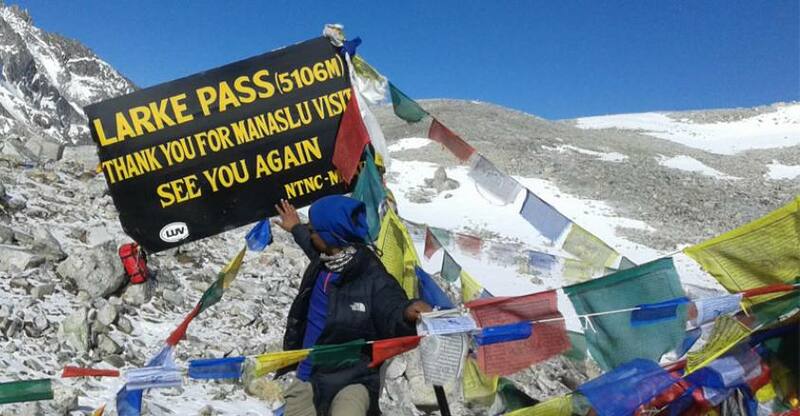 Manaslu circuit trek is providing tea house trek, therefore, camping trek is not required unless one goes off the track but if trekkers prefer to do camping trek we provide them camping service as well. Manaslu Circuit Trek with attractive views of Shringi Himal 7161mtrs, Himalchuli 7893mtrs, Nagdi Chuli(Peak 29) 7871mtrs, Mt. Manaslu 8163mtrs, Ganesh Himal II 7118m, Simnang Himal 6251mtrs, Saula Himal 6235mtrs, Cheo Himal 6812mtrs, Himlung Himal 7126mtrs and other beautiful peaks, unique landscape, lakes, species of birds, diversity, plants, mammals, forest vegetation, waterfall, Ancient Gumba, wildlife and flora fauna. We are only one local guide provider in Manaslu circuit trek for your holiday trip in Nepal. Day 03: Soti Khola to Maccha Khola (850m.) - 6 hrs. Day 04: Maccha Khola to Jagat (1380m.) - 6 hrs. Day 05: Jagat to Deng (1885m.) - 6 hrs. Day 06: Deng to Ghap (2123m.) - 5 hrs. Day 07: Ghap to Lhi (2946m.) - 5 hrs. Day 09: Lho to Sama Gaon (3515m.) - 6 hrs. Day 10: Sama Gaon to Manaslu Base Camp (5200m.) to Sama Gaon 8 hrs. Day 11: Sama Gaon to Samdho (3863m.) - 3 hrs. Day 12: Samdho to Dharmasala (4496m.) - 3 hrs. Day 13: Dharmasala to Larke Pass to Bhimthang (3620m.) 10 hrs. Day 15: Dharapani to Besi Sahar (760m. & Drive to Kathmandu – 5 hrs trek – 5 hrs drive. Drive from Kathmandu to Arughat takes around 7/8 hours traveling via Prithvi highway. Before reaching Malekhu turn North for Dhading Besi and then we reach Arughat Bazar. From Arughat drive to Soti Khola. Overnight at lodge. In the morning after having breakfast, we start our trek from Soti Khola. Passing through the forest we reach the villages named Liding and Laphubesi. The valley opens and trail drops to the graveled banks along Buri Gandaki river. Before heading to the village of Machha Khola we can have fine views of Ganesh Himal. Overnight at lodge. Crossing Machha Khola we head up to small village Kholabesi and reach the hot spring named Tatopani. Passing short section of forest and teahouses at dobhan we hike through farming terrace and villages until we reach to Jagat. Jagat is an entry point for the restricted area where permits are checked. Overnight at Lodge. In the morning trail begins climbing a rocky ridge with fabulous views of Mt. Singri (7187m.). The route continues following the stream of Budi Gandaki, along with a gorge section to the terraced field of maize, millet, and potato before entering the Nupri village through the forest. Passing through Philim village we finally reach village named Deng. Overnight at Lodge. walk Trail goes down to the Budi Gandaki stream and climb up to Rana village. Hiking along the lovely forest of pine and then crossing the bridge, we reach to Bihi Phedi from where we can have clear views of Mt. Kutang. Crossing different streams with gradual ups and down we reach Ghap. Overnight at Lodge. From Ghap we walk along beautiful rhododendron forest with lots of birds and langurs. Crossing stream flowing from Lidanda Glaciers we reach Tibetan village of Lhi. The trail climbs up with stairs to Namrung village. Passing Lama gaun we reach to Lhi. Overnight at lodge. 10 hrs. walk Today trail passes via rhododendron forest with the glance of different birds until you reach Namrung village. Hiking towards Lhi passing the Mani walls, farming terrace and the rural land of Lamagaun you reach Lho. Lho is a village with lovely little Monastries, Ribung Gompa, and Chorten. From Lho, we pass the stone gate and long Mani stone wall. You can witness excellent view of Mt. Manaslu from Lho. It takes around 6 hrs. to reach Samagaun from Lho. From Lho trail goes down to Hinang Khola which flows from Hinang and Lanjam Glaciers. After visiting the Hinang Glacier climbing gentle slope path we arrive at Lho. Overnight at Lodge. The trail from Lho passing along the forest of pine and rhododendron takes you to a Tibetan village Syala. You can view wonderful mountain panorama along the way. Passing Pung-Gyan Gompa you reach potato and barley fields and then to Samagoan. In Samagaon you can see women weaving wool into gowns that are traded to Tibet. Overnight at Lodge. hrs. From Base Camp, there is shorter trekking trail to Pungyen Gompa and icy lake, Birendra Tal. Walking through the forest area before you reach the ridge and grassy plateau. Here you will explore a gompa which was destroyed by the flood in 1953. Continue the trail to get to icy water of Birendra Tal which is situated at the base of the glacier, and if you're brave enough take a dip into the lake. Return to Sama Gaun and overnight at Lodge. Descending to Budi Gandaki River walking along the side of the river leads you to the Manaslu Base camp. You cross Larkya La Trail and moving ahead through the trail you will pass a widening Budi Gandaki valley. On the way, you pass several Mani walls and forest of Birch and Juniper before you reach Kermo Kharka. From Kharka you follow downward trail to cross the Budi Gandaki stream. From the river, you trek through a climbing trail that ultimately leads you to a stone hollow from where you can observe large white Kani. After passing through the site of Kani you reach the village of Samdo. Overnight at Lodge. Today you will cross Budi Gandaki stream and then head to Dharmasala passing the scattered settlements of local people through the steep trail until you reach to Dharmasala. After about three hours of climbing passing glaciers, with increasingly wonderful panoramas, you reach Dharamsala where you can gaze out at the views. Arriving at Dharmasala you can visit Mani walls, shops and enjoy the attractive view of villages like Larkya and Phedi. Overnight at Lodge. The trail passes through the most demanding trails of Manaslu Circuit as you have to cross high pass of Larkya La. After climbing a short trail you reach to the valley north of Larkya Glacier. While trekking along valley you can enjoy dazzling views of Larkya Peak and Cho Danda. Then trail ahead moves across moraines of Larkya. Glacial mass and following climbing steep trail you reach the highest section of Larkya La Pass. Top of Larkya La Pass rewards you the spectacular views of Cheo Himal (6820 m.), Kangguru (6981 m.), Himlung Himal (7126 m.), and the giant Annapurna-II (7937 m.). The descending trail from Larke Pass passes via low pasture land to Tanbuche and then down to Bimthang. Overnight at Lodge. Today our trail descends through the village of Kharche, Gho & Tilje respectively. Then reach Dharapani following the bank of Dudh Khola to the lower belt of Marshyangdi River. We meet Annapurna trail along the way and also we can see the excellent view of Manaslu and Annapurna I.Overnight at Lodge. After your successful trek to Himalaya, it is time to depart. you are dropped off to the airport approximately 3 hours earlier from your scheduled flight.